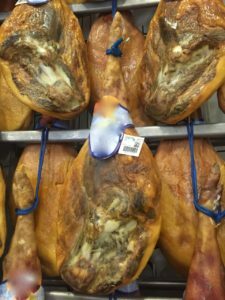 Serrano ham is probably one of the best known and most popular white hamsoort in Spain and in the rest of the world. Sierra means in Spanish “in high field matured”. The Serrano ham is a product obtained from white rasvarkens: Country race, Pietrain, Durok and Large white. These hams are produced from pigs be fed intensively with high good pig feed and grain. Serrano ham is a certified GTS-product(traditional specialities guaranteed, ETG in Spanish). This is a European quality seal which guarantees the compliance of the product with a number of requirements. This ham is minimal 7 months of ripening. Bodega or Cava; 9 months of ripening. Or Añejo Reserva:12 months of ripening. Gran Reserva: 15 months of ripening. Another kind of white ham is the "Jamón Curado". The hams under this name are less than 7 months of ripening and have no quality and no GTS.